COLUMBUS, Ohio – Record rain and extensive flooding and ponding have taken a toll on commodity fields across Ohio, leaving some growers facing diseased crops, the death of their plants and potential yield loss, according to agronomists in the College of Food, Agricultural, and Environmental Sciences at The Ohio State University. Depending on the growth stage of corn crops stuck in waterlogged soils, some growers could experience a yield loss of over 10 percent in corn crops that experienced as few as two days of flooding, said Alexander Lindsey, an assistant professor of horticulture and crop science at Ohio State. Corn crops that are still in the vegetative growth stage and standing in waterlogged soils for longer than two days could experience up to a 50 percent yield loss, he said in a report published in the latest issue of the college’s Crop Observation and Recommendation Network (C.O.R.N) newsletter. 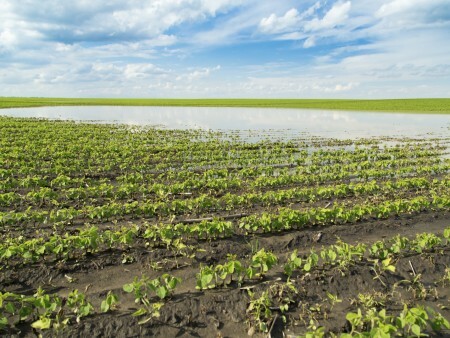 Flooding and ponding are also a concern for soybean growers, whose crops could face a yield loss of up to 64 percent for those plants in the reproductive stage that have been underwater for seven days or more, Lindsey said. Many fields have spots where the crop died from floodwaters and the remaining plants are stunted from too many days in saturated soils, said Ed Lentz, an Ohio State University Extension educator. OSU Extension is the outreach arm of the college. And for some growers, fieldwork that generally is completed by mid-July is now stretching into August because of the wet conditions, Lentz said. Rainfall in Ohio during the last 30 days has ranged from about 4 to 13 inches, according to Jim Noel, with the National Weather Service. Noel’s weather updates are featured in the C.O.R.N. newsletter. The widespread heavy rains in recent weeks brought some fieldwork to a halt in Ohio, according to the July 24 U.S. Department of Agriculture Ohio crop progress report. “Continued wet conditions hamper fieldwork,” Cheryl Turner, Ohio state statistician with the agency, said in a written statement, noting, “some areas of the state are still too waterlogged” for growers to work in their fields. The wet conditions have also caused some damage to crops, she said. “Some fields are showing damage from too much rain, particularly soybean fields with yellowing and some plant death,” Turner said. “Growers were also having difficulty cutting hay, harvesting wheat, spraying fields and spreading manure. Other growers are still assessing whether their crops are likely to become diseased or impacted by insects, and if the costs of fungicide and pesticide application will be worth the money spent, Lentz said. “Those applications may cost $30 or more per acre to apply, so growers have to ask if the applications will pay for themselves,” he said. “Growers are hoping the rains slow down but not stop altogether and their crops experience a drought in August,” Lentz said. “Growers want the moisture — they just want timely rains instead of the conditions we’ve experienced so far this year. “At this point, many growers are just hoping to make the most out of a bad situation.